Made to order only. Price will vary according to availability of stones, metals and a dinosaur tooth. 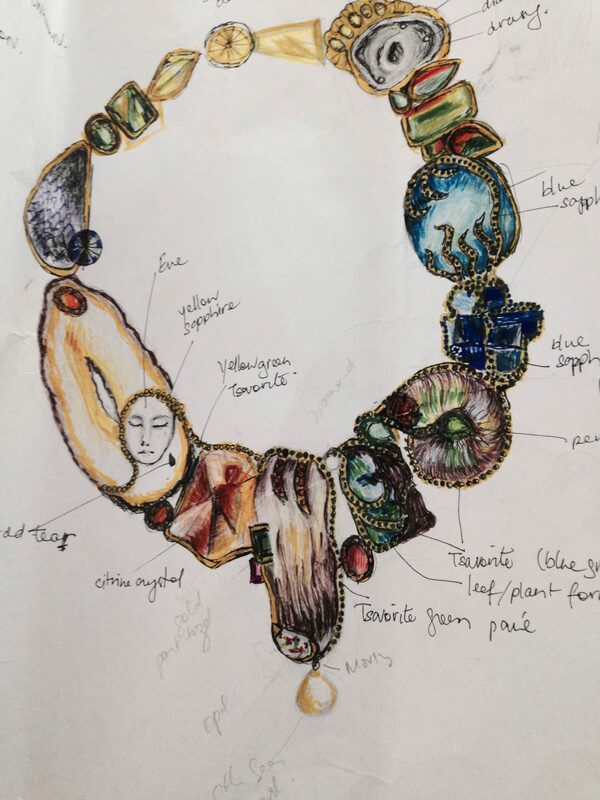 A decade ago Jane Magon wanted to create an 18 carat gold necklace about the beginning of the world. When Jane conceived this idea she referenced it to the ideas that had emerged as a response to the references of mysticism discussed in her Ph.D. – the Creation of the Earth – and the mystic’s collapsing together of macro and micro worlds. 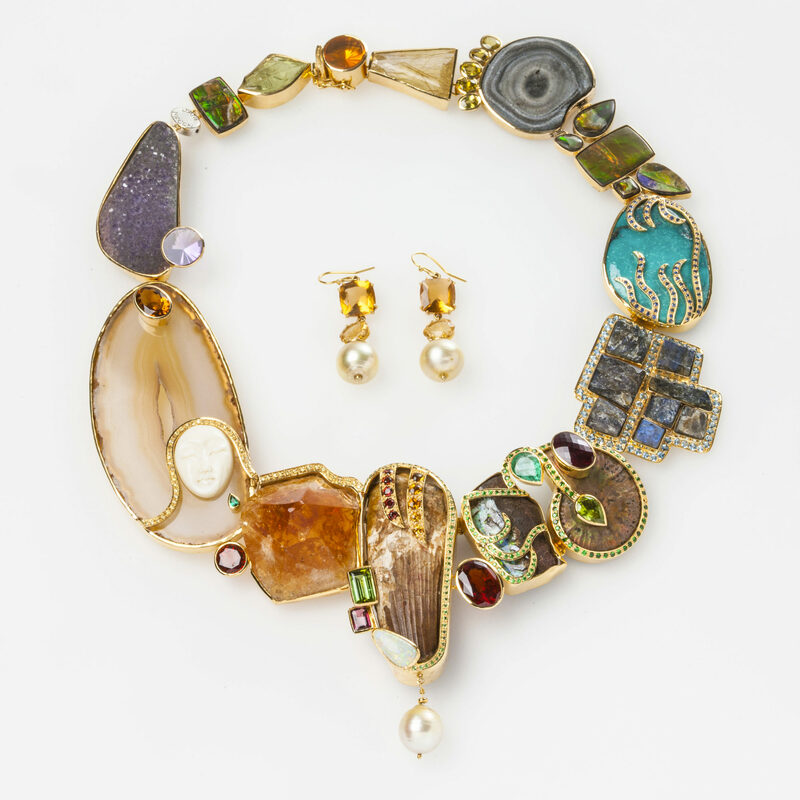 It took Jane ten years to collect the gems and fossils before she felt ready to take on the challenge to make something so innovative, such as this piece titled, In the Beginning: Earth’s Story: The Known and the Unknown. In this necklace Jane imagined the swirling gases and liquid rock moving in a centrifugal motion and references the geological formations – molten material that when cooled left visible rings. These ‘rings’ can be seen in the cooled agate slice and the crystalized, sparkly, druzy agate. This necklace refers to the origins of the earth. What are the beginnings of Earth? For some it is religious – for most educated people – the answer is ‘scientific’ – yet for others a scientific interpretation does not exclude a religious one. More than a decade ago I wanted to create an 18 KT gold necklace about the beginning of the world. I had been making more simply constructed ‘dinosaur tooth’ necklaces in silver (or silver and leather binding) for years. However, they became more complex over time. 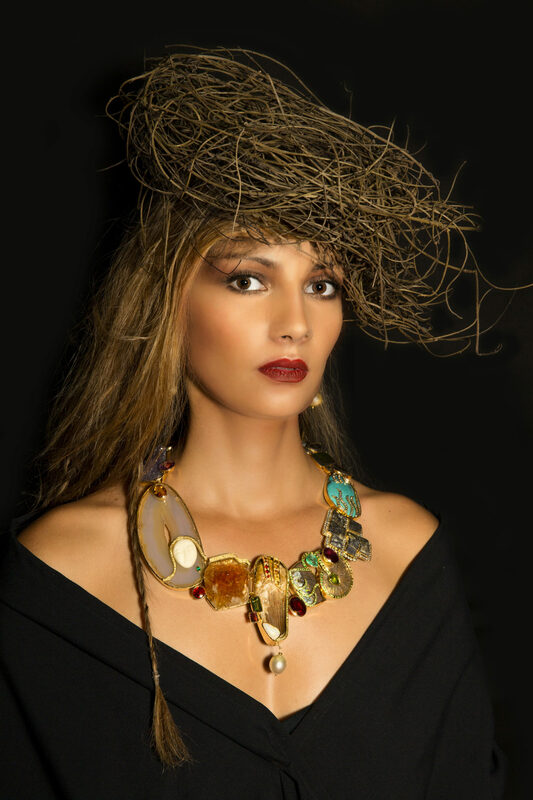 When I conceived of the necklace many years ago (the ideas had emerged as a response to the references to mysticism discussed in my Ph.D., which references the Creation of the Earth – and the mystic’s collapsing together of macro and micro worlds. It took ten years to collect the gems and fossils and feel ready to take on the challenge to make something so innovative, such as this piece titled, In the Beginning: Earth’s Story: The Known and the Unknown. In this necklace I imagined the swirling gases and liquid rock moving in a centrifugal motion and reference the geological formations, where one can see where compressed materials creating rock had emerged (after having been molten material that cooled and left visible rings). The full story of this piece will be the sole privilege of the owner, to share as they wish.